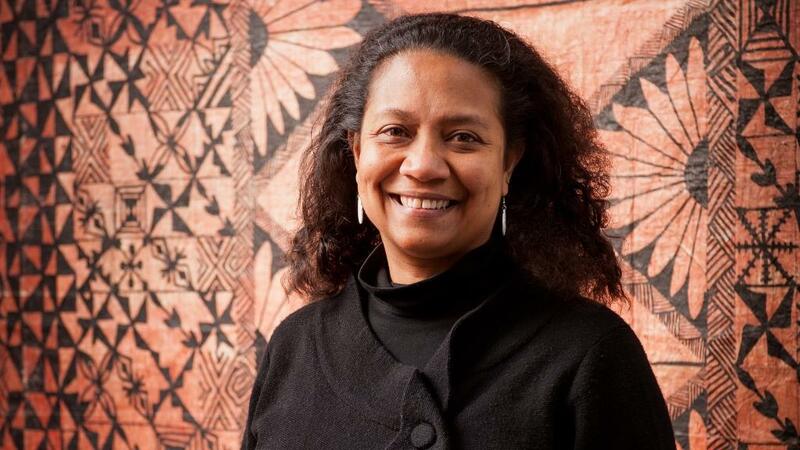 It is with great sadness that we share the news of the death of Dr Teresia Teaiwa, director of Va’aomanū Pasifika, friend, colleague, renowned scholar and poet, and a generous and warm personality of the Victoria University of Wellington community. Teresia passed away on 21 March 2017 in close company of friends and family after a short battle with cancer. Victoria's Assistant Vice-Chancellor (Pasifika) Hon. Luamanuvao Winnie Laban says the loss will be felt widely amongst the Pasifika community in New Zealand, the Pacific region, and elsewhere around the world. Teresia is internationally known for her ground-breaking work in Pacific Studies. Her research interests in this area embraced her artistic and political nature, and included: contemporary issues in Fiji, feminism and women’s activism in the Pacific, contemporary Pacific culture and arts, and pedagogy in Pacific Studies. In 2007, she was awarded a prestigious Marsden Fast Start research grant for her oral history and book project on Fijian women soldiers. In 1996, Teresia turned down a job with Greenpeace to take up her first lecturer position at the University of the South Pacific in Fiji. During this time, Teresia enjoyed being part of intellectual communities that stemmed from the University environment such as the Niu Waves Writers’ Collective, the Nuclear Free and Independent Pacific Movement and the Citizens’ Constitutional Forum. In 2000, she moved to New Zealand to join Victoria University to teach the world’s first undergraduate major in Pacific Studies, of which she was programme director until 2009. Most recently she was promoted to director of Va’aomanū Pasifika, home to Victoria’s Pacific and Samoan Studies programmes. Teresia’s talents in the classroom were formally recognised in 2015 when she won the Pacific People’s Award for Education, in 2014 when she received the Victoria Teaching Excellence Award and as the first Pasifika woman awarded the Ako Aotearoa Tertiary Teaching Excellence Award. In 2010 she received the Macaulay Distinguished Lecture Award from the University of Hawai’i. Faculty of Humanities and Social Sciences Pro-Vice-Chancellor Professor Jennifer Windsor says Teresia was “a remarkable academic leader who leaves a legacy of meaningful change at Victoria”. "As part of the FHSS’s leadership group, she guided others through her values, commitment to community, and sense of purpose. Teresia’s legacy at Victoria includes a number of successful teaching initiatives, such as introducing ‘Akamai’ for 100-level students, where students can choose to present their learnings through a creative interpretation. Teresia advocated that Akamai helps students to understand that art and performance are part of the intellectual heritage of the Pacific. Outside of her Victoria role, Teresia was the co-editor of the International Feminist Journal of Politics (2008-2011), and was an editorial board member of the Amerasia Journal and AlterNative: An International Journal of Indigenous Peoples. Alongside her scholarly publications, Teresia was also a celebrated poet and performer whose solo CD I Can See Fiji was described by a reviewer as a ‘groundbreaking collection of poetry’. She achieved a Bachelor of Arts from Trinity College, Washington D.C., a Master of Arts from the University of Hawai’i and a PhD from the University of California. A memorial service will be held for Teresia at Victoria University in the coming weeks. This tribute and imagery is used courtesy of Victoria University of Wellington.